This little space has been neglected this summer. It wasn’t intentional, it never is, but life doesn’t stop. It’s been a lazy summer with late mornings, copious amounts of coffee and tea sipped leisurely and schedules and plans thrown to the wind. There are times I just don’t want to cook or bake, create recipes, menus and blog posts. I don’t want to post a photo of my seasonal salad brimming with local produce; I just want to eat it and enjoy it. Sometimes, I think this whole social media craziness has taken the fun out of eating, going out, and just having fun. So, I’ve done nothing this summer, and enjoyed every second of it. I have sat on the sofa and watched Netflix with my daughters, I have listened to my son’s endless conversations about Pokeman and his obsession with Jordan shoes, and I have enjoyed date nights at French bistros with my husband. I’ve been lazy with my cooking too. It has been really hot in Denver and you all know how well I handle heat! The last thing I want to do on a hot a day is be in the kitchen cooking. Our grill has been getting a huge workout this summer. It’s so convenient to throw meat, chicken or seafood on a hot grill with a spicy, smoky rub or marinated in a tangy sauce or just toss in seasoned butter after it comes off the grill. A salad, lightly dressed with lemon and olive oil and dinner’s done. The abundance of summer produce makes getting a salad together a breeze. Soft butter lettuce, crisp, refreshing romaine, arugula or mizen tossed with crunchy cucumbers, ruby red or golden beets, colourful globes of rainbow radishes and liven up with seasonal peaches, nectarines, plums, cherries or jewel hued berries. If you’re feeling adventurous, grill the vegetables too and make a grilled vegetable salad or enjoy straight off the grates. One on my favourite salads this year has been the Caprese; vibrant and rosy heirloom tomatoes sliced, sprinkled liberally with sea salt, and arranged alongside creamy burrata or little morsels of mozzarella, and of course, the freshest and most fragrant basil you can find. A hefty glug of excellent olive oil all over and you’re done. Sometimes, I’ll drizzle a little white balsamic vinegar but usually, it’s really not needed. Too much of not doing anything can be quite detrimental though, especially to my creativity and inspiration. Procrastination, indulgence in long bouts of inactivity, binge watching brainless TV show leads to a dullness of mind and body! Many times I felt I needed to get back to my site that I pay a lot to keep up and running! I just keep hitting a brick wall because I was sure no one wanted to see another smoothie recipe, or the “best cinnamon rolls ever” or the “last brownie recipe you’ll ever need” or a “healthy” cake made with coconut flour, no eggs, cauliflower purée and basically, no taste (and no, I didn’t make one of these cakes, but it’s amazing what I see on blogs) I’m all for creativity but some times food should be enjoyed without interference. I really struggled on the inspiration front and of course, then the little thoughts of negativity crept in; do I want to keep doing this, who’s interested in what I’m cooking anyway, who wants ANOTHER cookie recipe, and so on and so forth. One day in Costco, I passed the magazine rack and saw all the beautiful front covers of food magazines and the inspiration of the chef, cook, food stylist and photographer splashed across each one. I picked up a baking magazine that drew me in with a photo of a beautiful cake on the cover and I threw it in my trolley as a splurge. That day I also found my Food and Wine issue that had gotten tangled in with the junk mail that comes in never ending stacks. The next two days I read each one cover to cover many times over. It was the spark I needed to get back to doing what I’ve enjoyed for so long but haven’t done in so long just for fun: baking. At home these days, I rarely make baked goods anymore. When the children were little the house always smelled like vanilla and cinnamon. There were goodies emerging from the oven on a regular basis and consumed happily by little girls dressed up as princesses. Being a stay at home mom had its advantages; baking and cooking were not jobs and I enjoyed baking at a leisure pace without deadlines and stress. The princesses grew up (into bigger and more entitled princesses) and now baked goods aren’t on their approved eating list. Baked goods are still very much on my husband’s eating list and he will happily eat all the trays and tins of the muffins, cupcakes, cookies and so on, but upsetting as it is for him and just as hard for me, I won’t let him. I wanted to bake for myself, for fun and for inspiration. I made a dozen muffins and took half to work to share with my guys and the rest we ate at home. I’ve decided to enjoy myself and bake what I want and I will just give away my experiments. The guys at my coffee shop have become my guinea pigs lately. Since I don’t bake often for home, I decided that I would make the muffin I like and want. None of that coconut flour, gluten free, spelt (though I like spelt) or avocado, black beans, chick pea water. I didn’t want dairy free, egg free or coconut oil, chia seeds or hemp, etc. I wanted grain flour, butter, heavy cream and all the goodness of the sweet, Colorado peaches. I did add a streusel for texture and a bit of rosemary for fragrance and interest. So, don’t eat 12 of these, but enjoy one and I know you will love it, because it’s a rich and dense yet soft muffin with crunchy bits on top. So, here are my Palisade peach muffins with a delicious rosemary streusel and minimum interference. Granted, it’s just a muffin recipe and there’s a million out there but this one really is the “best ever” 😉 It’s REAL food, enjoy it in moderation. Rich peach muffins made with local Colorado peaches with a crunchy rosemary scented streusel on top. Line a 12 hole cupcake/muffin tin with paper liners. Make the streusel by mixing all the dry ingredients and the rosemary together in a bowl. Add the melted butter and make a crumble mixture, keep aside. In a bowl, mix together the flour, baking powder and salt and keep to the side. In another bowl by hand or with a mixer, mix together the butter, vanilla and sugar together. Add the eggs and mix well until incorporated. Add the flour mixture and mix in gently. Add the cream and mix into a thick batter. If the batter looks too dry, add more cream by tablespoons till all the flour is coated and mixed. Add the chopped peaches and fold in gently. I used an ice cream scoop to make life easier. Sprinkle the rosemary streusel over the top the muffins, dividing between the 12 muffins. You may have a little leftover but the muffin will hold quite a bit. If some is leftover, you can bake separately on sheet tray and add the extra crumbles after the muffins bake for extra crunch. Bake in the centre of the oven for 25-35 minutes. Check with a toothpick to see if it comes out clean and the crumble is lightly browned. Cool in the pan for 5 minutes and the remove onto a rack. They are best still a little warm but because of the cream and butter, they will stay soft for day or two. Warm a little before devouring with coffee or tea. I have not perused Pinterest lately, has fall arrived officially in the blogosphere? These muffins look delicious. I love the fruits of summer, especially peaches. I am so sorry it has taken me so long to comment on this beautiful post. I have been helping with the kitchen remodel and it seems like there isn’t much time for anything else. I can’t wait to get back to cooking again. These muffins will be at the top of my list when that happens. HI Karen, no worries! I know you’ve been busy. I hope all is going well with your kitchen! Peach muffins.. Mmmmm, so good! I am glad you decided to keep writing and sharing here. When I read you Nazneen, it feels like being seatted around a table with a good friend and a coffee! Good that you enjoyed the summer vacation. Holidays are made to enjoy each moment and do only what we like to do. No pressure. Thanks Marie for your sweet words. You are welcome any time for coffee and a chat! I don’t have a much of a sweet tooth but I enjoy any pastry or desert that allows me to use herbs and fruits that are in season! So glad you’re back and at it on the blogging front! Looking forward to seeing what you come up for the winter! Thanks Mary! Love herbs with fruit and especially in baked goods! It sure sounds like we’ve taken the same path this summer, Nazneen. I’ve been spending more time in the garden but not doing anything productive. I have my morning coffee out there and return after dinner to watch the hummingbirds. (They’ve finally discovered my yard after 15 years of waiting.) You’d think that I could at least keep up with the weeds but, alas, that’s so not the case. The grill and grill pan are my friends, and so are paper plates. Running the dishwasher has become “an event.” You know what? I am so enjoying this summer! January won’t seem so bad with these memories to recall. Love, love, love the idea of these muffins! Peaches have been my fruit this summer. More so than tomatoes, I go to the farmers markets for the peaches this year. And I am rosemary’s biggest fan. Just before opening this post, I was just extolling its virtue to a cooking novice friend. The idea of using it with peaches in a muffin is genius and the scent must be heavenly. What a great idea! Muffins are one of the few things I bake because I can freeze most of them for later use. Thanks for sharing such a great recipe. PS … Don’t worry about blogging, There’ll be plenty of time for it once Old Man Winter returns. Enjoy your summer! I hear ya on the blogging front! We’ve been eating salads with a piece of salmon, chicken or steak all summer and no one needed to see it on facebook/instagram/pinterest. It’s nice to take a break occasionally I think it does you good. 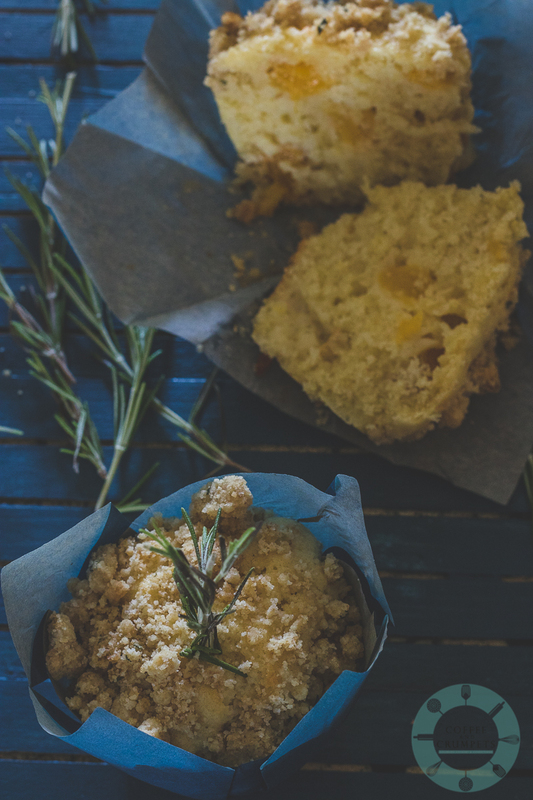 Great muffins – love your rosemary streusel topping. Good to see a post from you again! And definitely blog about whatever you want — blogs are always more interesting if people are writing about what interests them rather than post what they think the SEO gods will reward. Anyway, rosemary streusel? Brilliant! Wouldn’t have thought of that, but glad you showed me the way. Wonderful muffins — thanks. Hi Nazneen – so glad to see your post today. Sometimes, unplugging is needed in life – but am glad all those food magazines lured you back as you have been missed. And what a fabulous recipe to come back with! Such a wonderful and unique combo of flavors in these stunning muffins. Thanks Shashi! I’m getting back into it, slowly but surely 🙂 I have missed it but it’s hard to come back when you’re not inspired to do much. Summer is to be enjoyed, love how you paired the rosemary with peaches. Sounds and looks amazing. Love your pics! Thank you, Cheri! Yes, I agree wholeheartedly! I think I just got a big lazy doing nothing. Trying to get back into the groove again! Nazneen – the timing is perfect for these here in Tucson – the peaches this year are fantastic. And I happen to have 6 waiting for inspiration! (Which I just found!) And I love anything with rosemary! Good for you for taking the summer fro yourself and your family – family is the most precious thing in life! I will be coming to Denver fro work in the fall, and am going to extend my trip a day so I can see you! It will probably be the first Thursday or Friday in the month. Will you be around? Hi David! The peaches have been amazing this year! I think the hot weather has definitely helped the sweetness. Thank you, Nammi! I agree, blogging is hard work but the interaction with other bloggers and readers makes it totally worth the trouble! Glad that you have been enjoying the summer…love the flavour of these gorgeous muffins. it is so nice to see you write again. social media is just crazy and im totally guilty of being so tied to it. my boyfriend absolutely hates it and its a good reminder for me to not always snapchat or instagram things..peaches + rosemary is not something i would thing would go together but these muffins are calling my name! have you seen chef’s table on netflix? Hi Dixya! I know, social media is just a part of life now and especially if you are a blogger or have a presence on the Internet. I don’t think I’ll ever get good at it but I know I have to try! Rosemary and peaches are an amazing combo! Hope you get to try it one day!